Five years ago the Edinburgh athlete Gill Cooke made the successful transition from track and field to bobsleigh, winning the World Championship with driver Nicola Minichiello in 2009. Cooke's pedigree as an athlete was impressive: a powerhouse sprinter, she competed at the Manchester and Melbourne Commonwealth Games, as a pole vaulter and then long jumper. 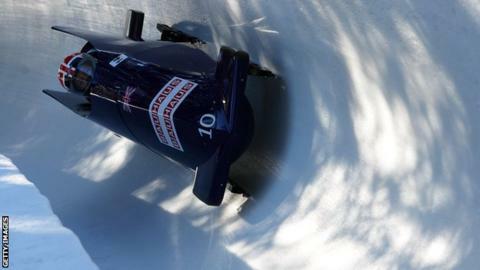 These qualities were desirable to Team GB Bobsleigh and Cooke accepted their invitation to try out as a brakewoman - a role she embraced despite the extreme challenges of her new sport. In this month's Sport Nation I was given the unique insight of joining Gill and Team GB as they prepared for the 2013 World Bobsleigh Championships in St Moritz. And this reporting assignment was a real eye opener! I have seen a great deal of international sport over the years - and, generally, the more successful the sportsman or woman, the more demanding, pampered and protected they become under the wing of coaches, administrators and agents. But that is not the case at all in the egalitarian world of international bobsleigh. These elite athletes - many of them Olympians - are totally responsible for the carrying, transporting, maintenance and preparation of their sleds, which weigh 170 kilos - almost 27 stones. Combine the skills of mechanic, engineer, weightlifter and international sprinter and that's pretty much the description of a bobsledder. Spanners and wrenches are as vital in their kitbag as running spikes and helmets. It's not for the faint-hearted or those who fear frozen fingers as they work in temperatures as chilling as 20 degrees below. And let's not forget the danger. Travelling at speeds of 90-100 mph, as Gill Cooke says, when they crash: "It's basically a battle for survival. You have to make yourself as small as possible and get as much of your skin off the ice as you can. "Generally your head on the ice is the best thing as it's protected by a helmet. "Imagine your skin being dragged along concrete at 90 miles per hour. "It's not that much different on ice." Most surprising to me was the number of high-profile track and field athletes making the transition into the bobsleigh world. At first they were difficult to spot around the bobsleigh paddock, wrapped up under hats and jackets and lugging sleds with their teammates. At athletics events, former world champions Jana Pittman (Australia, 400m hurdles) and Lolo Jones (USA 100m hurdles) would be mobbed by adoring fans and constantly photographed. They are the gods of international athletics, and yet in this environment they are ignored. The lure of this dangerous and challenging sport for these powerful sprinters is they can have another bite at Olympic success - but this time on ice. The attraction of next year's Winter Olympic Games in Sochi is strong indeed! In Sport Nation we meet these new stars of the sport and follow the fortunes of Gill Cooke and her Team GB driver Paula Walker as they compete for World Championship glory. But there's a problem - Paula has a serious knee injury AND anything less than a top 8 finish will threaten their funding for the year ahead and their Olympic build-up to Sochi 2014. Oh yes, and one more thing…apparently you can't visit St Moritz without experiencing the space shuttle-like G-force of the Olympic bob run! It was an experience like no other! Check out the screaming on Sport Nation, Tuesday 5 March, 19:00 GMT, BBC Two Scotland.